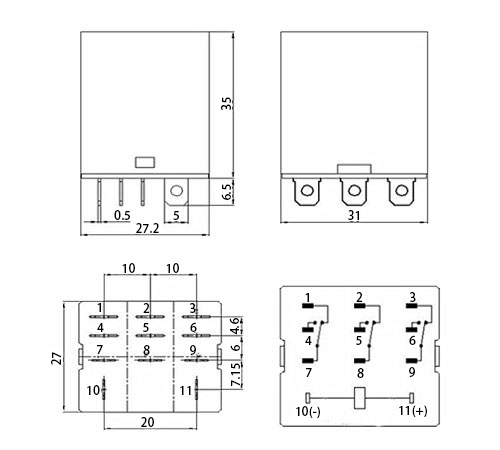 Low cost and high quality electromagnetic relay, 11-pin 3PDT, plug-in terminals, silver alloy contacts, and contact load 10A/240V AC 28V DC, common coil voltages of 12V DC/24V DC/110VAC/220V AC for your choice. 11-pin 3PDT Electromagnetic relay are available for 12V DC, 24V DC, 110V AC and 220V AC coil volatge, with rate load 10A/250V AC 28V DC. Transparent housing, small size, long service life and high reliablity. 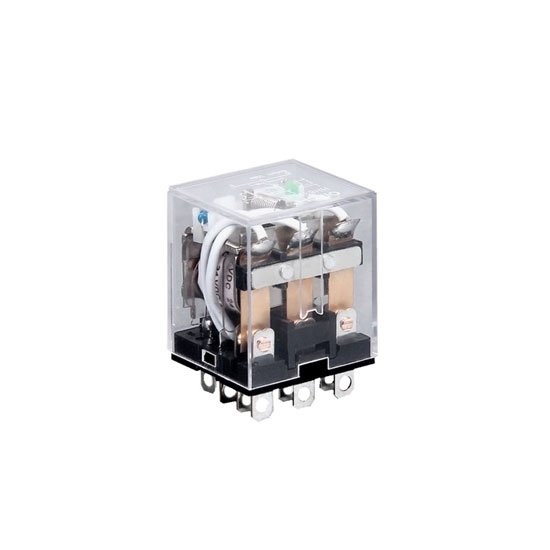 Compact-size electromagnetic relay, 14-pin 4PDT, available for 12V DC/24V DC/110VAC/220V AC coil voltage for your selection, contact load 10A/240V AC 28V DC, transparent housing, silver alloy contacts with long lifespan. General purpose electromagnetic relay, 11 pins, 3PDT contact type, available for the common coil voltages of 12V DC, 24V DC, 110V AC and 220V AC, rated load 5A/240V AC 28V DC, compact size, favorable price and high quality. 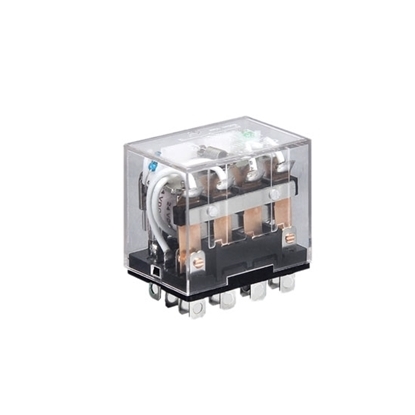 Small-size electromagnetic relay with 14-pin 4PDT, has a wide coil volatge available for the selection like 12V DC, 24V DC, 110V AC and 220V AC, and contact load is 3A/240V AC 28V DC, economical price and high reliability. 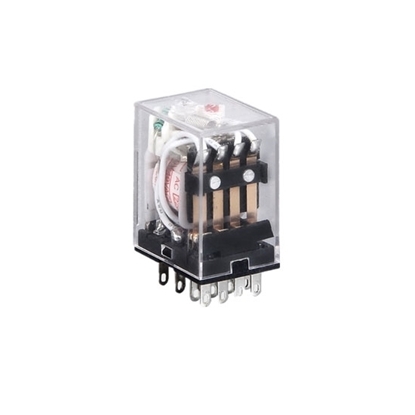 Compact-size electromagnetic relay is used for general purpose with 11 pins, 3PDT contct type, and widely applied in electronic equipment, communication equipment, automatic control system, instrument and meters, etc. Note: Here just shows the contact form 3PDT, and another contact forms 3NO and 3NC are still available. What's more, please kindly note that other coil voltages are also available(DC: 6-220V; AC: 6-380V). If you have any requirments, please don't hesitate to contact us. 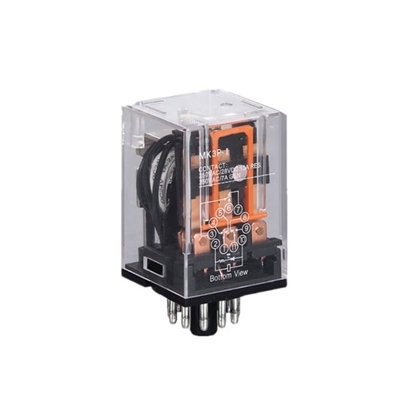 Tips: How to select a relay? Working environment mainly refers to temperature (maximum and minimum temperature), humidity (maximum relative humidity in -40℃), low pressure (it is unnecessary for places with an elevation of lower than 1,000 meters to consider the factor), oscillation and impact. In addition, service environment involves requirements for packaging mode, installation mode, shape, dimensions, and insulation performance etc. Select electromagnetic, temperature, time or photoelectric relays by judging whether input signals are electricity, temperature, time or photo signals. Input parameters refer to working voltage (or current) of the coil. Pull-in voltage (or current) refers to the parameter used by relay producers to control sensitivity of relays. Configurations and groups of contacts shall be determined according to actual conditions of controlled circuit. It is very important to determine parameters according to load capacity and load nature (resistive, inductive, capacitive, light load and motor load). 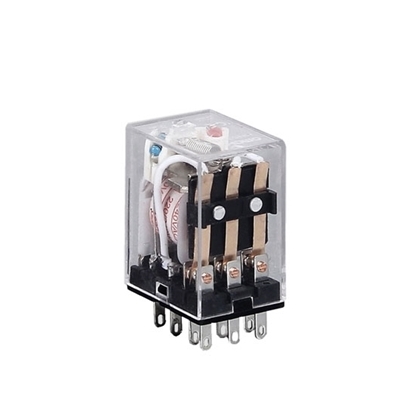 I bought 5 relays, 3 of which are 24V and the other two are 110V. They do the job I was looking for. I use them to reverse polarity so an actuator will extend or retract depending on if the coil is powered or not by a photocell. Good build quality, would buy again.